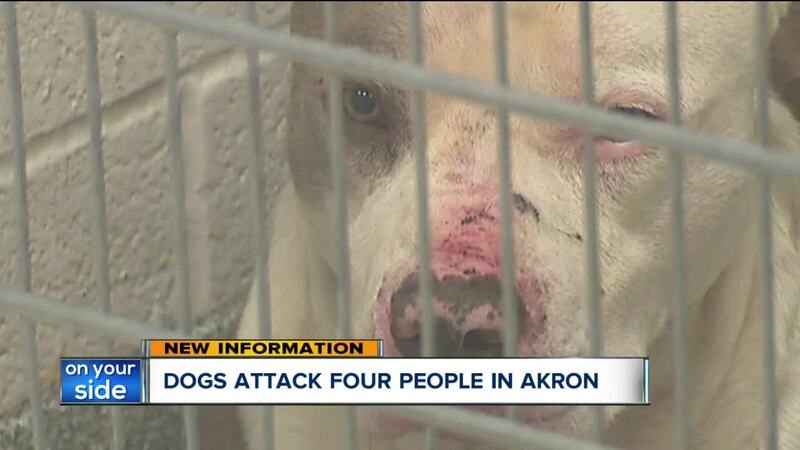 AKRON, Ohio — Four people, including a mail carrier, were bitten by a pack of three dogs in two separate incidents in Akron Monday morning, according to police. The dogs fled, then bit a mail carrier on the back of his left thigh, the report states. The mail carrier then sprayed the dogs with pepper spray and they retreated towards the east. The mail carrier’s pants were punctured, but he didn’t believe they bit his leg. Another woman reported that she was attacked by three dogs on Milton Street near Roscoe Avenue at about 11 a.m. She told police she was walking on the street when the dogs bit her on the head, arms and legs. Some men driving by stopped to assist. She said the men first tried to grab her and pull her to safety while driving. When that didn’t work, the men hit the dogs with sticks to get them off of her. That victim was taken to a nearby hospital for evaluation and treatment. A follow-up revealed she had extensive injuries from the attack.